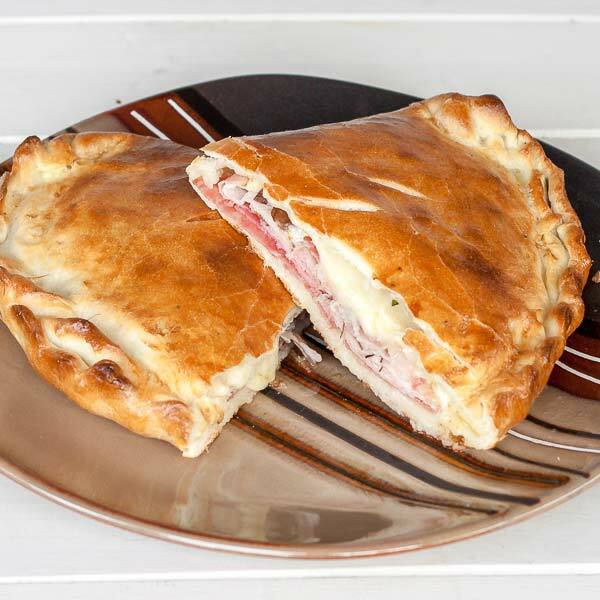 Back to pizza… well calzone is not exactly a pizza but it uses the same dough. Traditionally it is stuffed with tomatoes and mozzarella and may include other ingredients usually associated with pizza toppings, but you can definitely let your imagination do the talking and use whatever you want… that’s why mine has a lot of meat, vegetarian anyone? For this one I used my Easy Pizza Dough recipe in which I added a bit of basil, but be creative, don’t just copy me :P. You can use the whole dough to make 4 calzones but if you want to make less then adjust the toppings from this recipe accordingly. Well, when you have the dough ready, cut it in four and start rolling. Don’t make it too thin or it will crack and not hold the ingredients inside very well, about ¼ inch (½ cm) should be enough. When you reach the size you want start by adding the toppings. My options here were: salami, shiitake mushrooms finely chopped, some smoked back bacon, pièce de résistance – pancetta and a mix of finely sliced Swiss cheese and provolone. 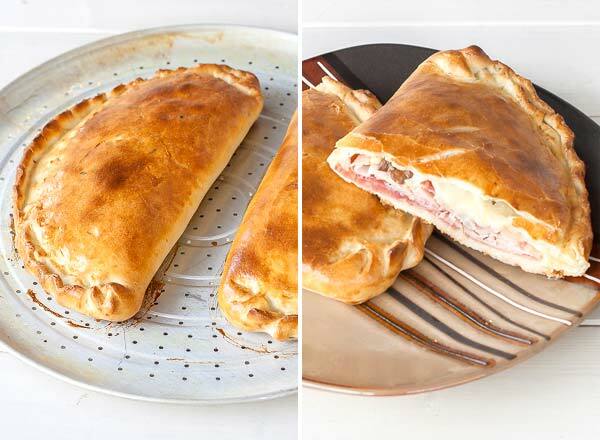 Make sure you leave the edge clear so you can properly seal the calzone before baking. Hey, you can never have enough toppings, trust me, but when you are done fold and seal it same way I did in this picture. All you have left at this point is to bake it, which is best done at 500° F / 260° C for about 10 to 15 minute, or until nice and golden brown. They say you should make a little cut on top of it so that steam can escape from inside, but mine was fine without it. However, I suspect if you put a lot of wet toppings inside, like tomatoes and whatnot you might want to do that opening. Make the dough from my Easy Pizza Dough recipe and slice it in 4 equal parts. 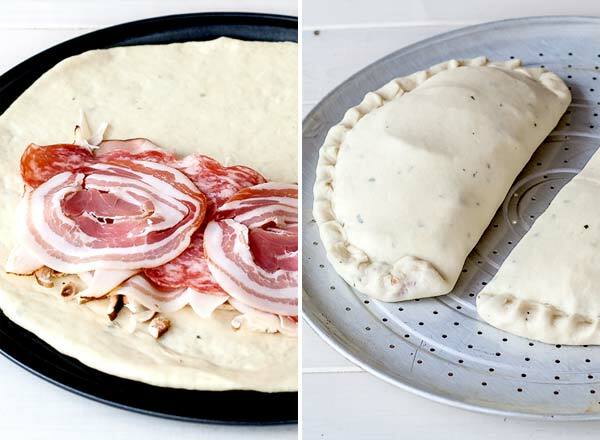 Add your ingredients but not too close to the edge so you can properly seal the calzone before baking. Preheat your oven to 500° F / 260° C.
Wash your calzones with some eggwash and bake for 10 to 15 minutes or until golden brown. You need to watch it like a hawk though :).